Fruits make a wonderful substitute for sugar laden snacks. Buy them organically grown or wash carefully because fruit is often heavily sprayed with pesticides. They are easily digested and alkalizing and most fruits are low glycemic. In fact, eating low glycemic fruits can improve glucose in normal adults. What a wonderful way to help you lose fat - eat fruit for dessert! For the most part I would say eat your fruit whole and with water if you are thirsty. Do NOT drink it as juice. Fruit juice is very high in calories and can raise your blood sugar because the natural sugars are so concentrated and so much of the fibrous part of the fruit is eliminated. Another reason to eat the whole fruit is that the peels and rinds contain lots of nutrients. Fruits do not combine well with other foods with some exceptions. Some fruits go well with lettuces and celery. For example many fruits are good in salads and apples mix well with celery and zucchini or other greens in a green smoothie. Make the fruit the entire snack or have it for dessert after your meal. Read on for more fruit nutrition facts. "An apple a day keeps the doctor away!" How true this is - let's look at how and why. Apples supply lots of good phytochemicals, the plant nutrients that support our health. Talk about antioxidant rich foods. The antioxidants that are in apples are called phenols. Research done at Cornell University in Ithaca, N.Y. and Seoul University in South Korea found that phenols provide most of the antioxidant power in apples. This research shows cranberries containing the most phenols and apples second and both these fruits showing the highest overall antioxidant activity. More fruit nutrition facts in some very large studies noted the protection from heart disease we get from apples. Eat the peel because it contains a powerful flavonoid called quercetin which has anti-cancer activity as well as lowering the risk of coronary heart disease. Apples support healthy lungs. Finnish researchers found fewer cases of asthma among people with high levels of quercetin in their diets. In addition to containing potassium and vitamin C, apples support your gallbladder and a healthy brain. Apparently, quercetin also increases neurotransmitters. A medium sized apple is only 70 calories and has a lot of fiber making it a perfect diet food. Apples contain pectin, a fiber that slows down the absorption of food and helps you to feel full. The pectin helps to clean out metals and toxins, helps to lower cholesterol and also reduces the risk of heart disease. The fiber in apples prevents constipation and supports healthy bowel function. All of these fruit nutrition facts support the notion that more fruit in your diet will help you to manage your weight. Apples need to be a part of your daily eating plan. Lucky you if you have access to an apricot tree. Apricots are a delicious treat when vine ripened. In fact, eat all fruits vine ripened when possible because they lose many valuable nutrients when picked green. More fruit nutrition facts about apricots include that they will help you fight infections, blindness, heart disease and cancer. This is because they are full of carotenoids, the color pigments that act as powerful antioxidants. They are responsible for the yellow, red and orange colors and convert into vitamin A. Some fruit nutrition facts about apricots are that only three of them will provide 25% of your Recommended Daily Allowance of vitamin A and they provide fiber. In addition to beta-carotene they contain another carotenoid called lycopene which fights LDL cholesterol, the bad cholesterol. Lycopene is a powerful antioxidant as well so eating apricots helps to prevent cancer. Be sure to eat the skin which contains most of the fruit's fiber. 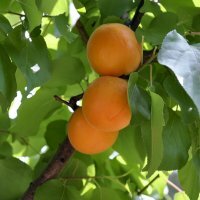 Apricots are high glycemic when they are canned. The fresh are also listed on the Glycemic Research Institute's unacceptable/high glycemic list. However, today I think it's hard to find a fresh apricot that is ripe enough to elevate your blood sugar. If they are not overly ripe they are more likely moderate to low. Bananas are NOT a low glycemic fruit, however, they are such a good source of potassium and fiber that I recommend eating them in moderation once you've reached your goal weight. Eat them alone as a mid day snack or for breakfast with sprouted grain toast as they are quite filling. Tropical fruits seem to pack in a lot of nutrition and bananas are no exception. Fruit nutrition facts tell us that the banana is one of the most important food sources for potassium. Many studies have been done showing that people who eat foods rich in potassium have a significantly lower risk of high blood pressure and related diseases like heart attacks and strokes. Bananas are a good source of pectin, the water soluble fiber that supports good colon health. The potassium helps you to replenish electrolytes if you have become dehydrated. Easy to digest and a good source of quick energy because they are high glycemic, consider having 1/2 a banana for breakfast with cereal or in a smoothie. That way you will use the energy during the day. These are extremely antioxidant rich foods. It is easy to find fruit nutrition facts about berries probably because of their high antioxidant content. The berry family includes those which can be picked wild, huckleberries, gooseberries and blackberries and those that are cultivated, strawberries, raspberries and blueberries. Of course all these may be found in the wild and in grocery stores nowadays but they're more nutritious when freshly picked. All berries are low glycemic and nutrient dense. Because cranberries require so much sugar to make them palatable I have not included much about them except for one medicinal use. Cranberries are known to be helpful in treating and preventing urinary tract infections. Find the unsweetened cranberry juice and drink it diluted with water. 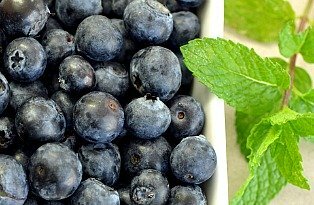 More fruit nutrition facts are that blueberries, which are rich in polyphenols (antioxidants,) have the ability to reverse and slow age-related brain deterioration! So there's another reason to make blueberries part of your daily eating. They may be the ideal anti-aging food. Blueberries are one of the top antioxidant foods. Blueberries are a good source of manganese which is good for the bones and blood. Raspberries and strawberries have the most ellagic acid which helps to prevent the cellular changes that lead to cancer. 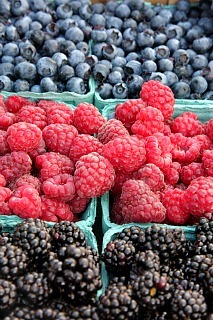 Berries contain other phytochemicals that fight cancer: flavonoids, tannins, phenolic acid and lignans. All berries contain large amounts of vitamin C which helps to fight cataracts, reduces your risk of heart disease and helps you to fight infections. The fiber in berries help to prevent constipation. As noted above, cranberries contain phenolics which are powerful antioxidants. There are lots of positive fruit nutrition facts about figs. Figs can help to lower high blood pressure, relieve constipation, control cholesterol, prevent colon cancer and control weight gain! This is because figs are full of fiber. 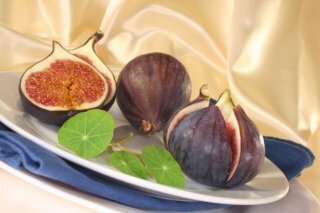 Just 3 figs provides you with 20% of your daily requirement of fiber. They are so full of fiber they stay in your stomach longer helping you to feel fuller. They are low glycemic and they are quite sweet which helps to satisfy your sweet tooth. Just don't go overboard but 3 fresh figs along with a serving of raw nuts will make an excellent low glycemic snack. More fruit nutrition facts about figs are that they are high in potassium which is good for your blood pressure by preventing the LDL cholesterol from building up on artery walls. Potassium also keeps the heart strong. Lastly figs contain B6 - just 3 figs will give you 9% of your daily requirement. Guavas come from the tropical family and are full of carotenoids so they are antioxidant rich foods. Fruit nutrition facts tell us that they contain lycopene, a carotenoid and antioxidant thought to block the growth of lung and breast cancer cells. Lycopene is in tomatoes as well but guavas are an even better source with 50% more lycopene in just one guava! Studies have been done showing that men getting enough lycopene in their diets have a lower risk of prostate cancer. It is also a fine source of fiber containing about 9 grams per cup. Getting enough fiber is a good way to manage cholesterol. Kiwis are packed with vitamin C. These odd looking little fruits, furry brown eggs with luscious green centers with black seeds, originated in China where they were called the Chinese gooseberry. When they were planted in New Zealand they got renamed and soon they were being exported. Now they are planted in abundance in California and probably other parts of the world. Kiwis contain potassium and pectin, the soluble fiber that helps to control blood sugar and cholesterol. There is an enzyme in kiwis called actinidin, that is a natural meat tenderizer. It can be used as a marinade or you can just rub the meat with cut kiwi 30 - 60 minutes before cooking it. Kiwis are high glycemic only if they are overly ripe. Nectarines are the cousins of peaches but they are sweeter, easier to eat without the fuzzy peel and it turns out that they are more nutritious! Apparently, nectarines are not a cross between a plum and a peach but rather a genetic variant of the peach. The nectarine is a darker yellow/orange than the peach and contains more beta carotenes, the antioxdant that converts to vitamin A. One nectarine is about 50 calories, it's low glycemic and contains enough vitamin A to give you 20% of your daily requirement. It is also high in potassium and contains a little vitamin C. It contains bioflavonoids including carotenoids which are the plant pigments that are antioxidants and they are high in the fiber called pectin that helps prevent constipation and high cholesterol. Unless you've eaten a ripe nectarine directly from a tree you really don't know what a nectarine tastes like. The ones we get in the stores are disappointingly bland. Nectarines are intensely sweet and juicy. Everyone knows that oranges contain a high amount of vitamin C and fiber but some other fruit nutrition facts are that they are full of other valuable phytochemicals that block cancer and provide health benefits. In short they are a powerhouse of nutrition and what a great way to get your vitamin C. These antioxidant rich foods are harvested in the winter which makes them a welcome treat in December and January. Some of these plant compounds that support our health and block cancer are limonin, limonene, limonin glucoside, and hesperidin. Hesperidin, can raise the good HDL good cholesterol levels and lower the LDL bad cholesterol in rats. Studies now need to be done on people. Fruit nutrition facts tell us that some researchers have shown that hesperidin can help to stop inflammation. The Florida Department of Citrus Research Center has shown that limonene can help block lung and breast cancers. Vitamin C can help fight infections by boosting natural immunity and it also helps you to absorb iron from food. In a large study at the University of California, Berkeley, Gladys Block, PhD, noted that in most studies people who got the most vitamin C had the lowest risks of cancer. Vitamin C is also effective in reducing the risk of stroke. The fiber in the orange supports good colon health and can help control changes in blood sugar. Oranges also contain potassium and some calcium. The interior white membrane is an excellent source of bioflavonoids. Orange juice is best fresh squeezed but if you buy the juice get it with pulp. Considering that these fruit nutrition facts imply that oranges can help you lower the risk of heart disease and stroke, fight cancer and promote your regularity, orange juice may be the one juice you drink. Papayas fall into the category of tropical fruit but are available now in many grocery stores in North America. They are high glycemic only if they are overly ripe. 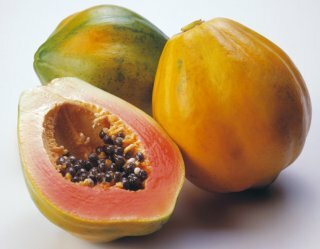 If you are lucky enough to live in a climate that grows papayas then you are familiar with their delicate deliciousness. Fruit nutrition facts tell us that papayas not only taste great but they are excellent for your digestion. That's because they contain a number of protease enzymes, papain for one which you can buy in many supplements to help ease digestive difficulties. Specifically they help you to digest proteins. You can tell from their luscious yellow/red color that papayas contain lots of antioxidants, the carotenoids, the natural plant pigments that give color to fruits and veggies and provide protection from free radicals. Papayas contain more than most, with half a papaya containing 3.8 mg. of carotenoids. Peaches are a perfect low glycemic snack. They are only 35 calories, taste delicious and contain vitamin A and a little vitamin C. They are high in fiber, especially pectin which helps to lower cholesterol. They are always better to eat fresh because they have fewer calories than canned and more nutrition. Try to buy peaches that are ripe not only for more nutrients but because they do not become sweeter after picking. If you buy unripe peaches try putting them in a paper bag to ripen. They will then keep refrigerated for 3 - 5 days. The pear was reclassified by the FDA in 2005 when new research showed that 1 pear contains 6 grams of fiber. That's a quarter of your daily requirement. Do you think it would make sense to eat lots of pears if you were trying to lose fat? Almost half of that fiber is pectin which, as you are probably fully aware by this time, is the water soluble fiber that helps to reduce cholesterol. The rest of the fiber is insoluble which means it absorbs water and helps stools to pass more easily through your digestive tract. The fiber is good for your colon, preventing constipation and also reducing the risk of colon cancer. More fruit nutrition facts about pears are that they have a significant amount of potassium, 5% of the required daily amount needed which supports normal blood pressure. Pears also contain some vitamin C and a bit of copper and boron. Boron supports good bone health and brain function. Pineapple is another tropical fruit that is shipped practically everywhere now. Some fruit nutrition facts are that pineapples are full of beneficial nutrients which improve digestion, ease inflammation, keep our bones strong and fight infection and disease. Pineapples are high glycemic so it's better to wait until you are at your goal weight to eat this fruit or eat it early in the day and with some protein. A dish of chopped, fresh pineapple with 1/2 cup cottage cheese to minimize the glycemic affect would be fine for breakfast. Do not eat it canned. Like papaya, pineapple is known for it's digestive enzymes. Enzymes are protein molecules that are active in all biochemical activities in the body. They are essential for digestion, for stimulating the brain, providing cellular energy and repairing cells and tissues. Pineapple contains bromelain, a digestive enzyme that can actually help to ease inflammation as well as help the body in digesting proteins. Bromelain has powerful anti-inflammatory benefits according to Eric Sector, a bromelain researcher, ND and NIH postdoctoral fellow in immunology at the University of Connecticut. In Germany, the government agency that regulates herbs and other supplements has approved bromelain for healing after injuries and surgical procedures. What else do fruit nutrition facts tell us about the pineapple? Pineapple also contains the trace mineral manganese which helps to support the bones and builds connective tissues, skin and cartilage. In fact, 1 glass of juice gives you your daily requirement of manganese, 2 mg. And we can't forget the vitamin C; again 1 glass gives you 100% of your daily requirement or better yet avoid a glycemic load and eat 1 cup of pineapple chunks for almost half your daily requirement of vitamin C. These fruit nutrition facts indicate that although pineapple is a tropical fruit it has real medicinal benefits. Plantains contain even more potassium than bananas and they aren't as sweet which means they have a lower glycemic index rating. Still, eat them sparingly in the morning for breakfast if you are trying to lose fat. Plantains need to be cooked so you can steam them and then mash them for a tasty side dish. One cup delivers 20% of your daily requirement of potassium and remember that potassium protects you from heart disease. There have been many studies done showing the heart health benefits of potassium. Foods rich in potassium can reduce the need for high blood pressure medication. Of course always check with your doctor before going off a medication! There are more interesting fruit nutrition facts about plantains. Plantains are known for their nutrient benefit to the gastrointestinal tract. In India plantain powder is used to prevent and treat ulcers. It is helpful in soothing inflammation in the gastrointestinal tract and could be helpful for Crohn's disease and ulcerative colitis. Plantains also provide some folate and vitamin C.
Plums are only about 36 calories each and contain some pectin, some vitamin C, some riboflavin and a little potassium. Like the other stone fruits they are low glycemic and make great high fiber snacks. 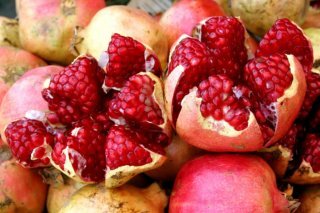 Pomegranates are a magical fruit, all leathery on the outside and hundreds of little shiny droplets of yummy juice inside called "arils." There are some powerful fruit nutrition facts relating to these interesting fruits. Pomegranates are antioxidant rich foods and contain flavonoids that protect against cholesterol damage. There was a 3 year study done at UCLA in Los Angeles that showed that 1 glass of pomegranate juice daily slowed the rise of cancer markers called prostate-specific antigens (PSAs) to one quarter their usual rate. These were 50 men who had undergone surgery or radiation for prostate cancer. It is thought that the antioxidants produce healthy cells and the isolflavones may trigger the death of the cancerous cells. Hmmm....if you are at risk for prostate cancer it couldn't hurt to make pomegranate juice part of your daily eating regime. Drink it in the morning after a protein breakfast to reduce the high glycemic effects or dilute it with water. I hope these fruit nutrition facts have made it abundantly clear to you that a variety of fruits ought to be a significant part of your diet along with a variety of vegetables. Eat only fruit for your snacks and you WILL lose fat! Eat locally, organically grown produce that is in season if possible. However, if you are eating fruit for medicinal reasons or as a substitute for a high glycemic snack - wash well and just go for it! Most people do not eat nearly enough of any of these nutritious plant foods which may be one reason we see so many diseases on the rise. Research reveals more and more nutrient benefits which means we will all be healthier if we are eating at a minimum 5 - 10 servings of fresh fruits and vegetables every day. Eating 3 - 5 servings of low glycemic fruit a day will help you to balance your blood sugar. Fruit nutrition facts confirm what we already know to be true...that food is still our best medicine. If you want to lose fat you must eat more vegetables! Stressed bodies need more nutrients. Polysaccharides are the super sugars that support optimal health, not wreck havoc on your blood sugar. Do not mess around with diet gimmicks or pills that destroy proper hormone balance. Your liver is your body's chief detoxifier. Your fat cells are loaded with toxins. This is the most essential tool you can have to restore the metabolic capacity of your cells. Return from Fruit Nutrition Facts to Food Nutrition Facts. Return from Fruit Nutrition Facts to Lifetime Fat Loss home page.